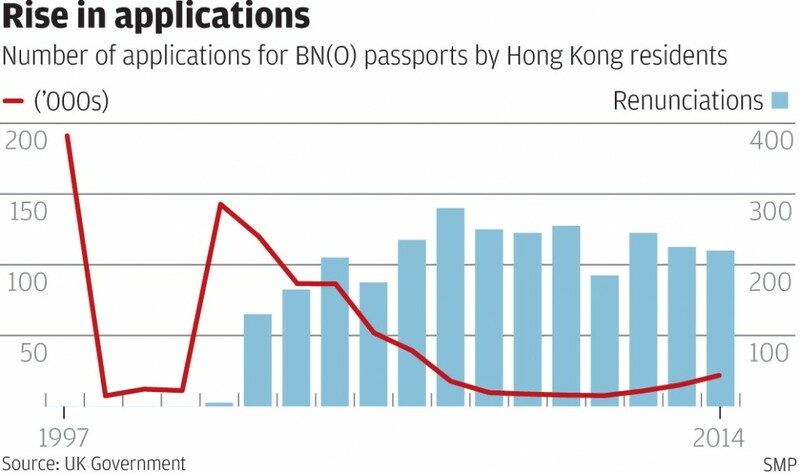 With political jitters in Hong Kong there has also been an increase in the number of applications from those renewing their BNO passports. After a steady decline in BNO renewals there has again been a marked uptick in the renewals of BNO passports. Can this really be because of political turmoil in Hong Kong or is it simply that many passports are starting to expire after a 10 year period. From the South China Morning Post the British government figures show that the number of British National (Overseas) passports renewed by Hongkongers rose 22,022 last year, after falling to a near-record low of 7,654 renewals in 2011. Since Leung Chun-ying took office in 2012 the uptick has been noticeable with an increase of 40% each year in renewals. Getting any replay from the British Consulate in Hong Kong meets with a dead end for comments. The special BNO passport mainly works as a British travel document however it does not give the holder of the passport the right of abode in the UK. There are now about 3.4 million BN(O) passport holders in Hong Kong alone. With recent political protests in Hong Kong BNO passport renewals have seen a massive eight-year high. In 2014 the price for the passport was reduced by HK$600 which put the price of a new BN(O) passport at about HK$1,200, and the rate of renewals of the passports ticked up to 43 per cent. The reason for the spike in BNO renewals are not known however many feel that they have more options with two passports rather than one if the political turmoil continues. The Daily Mail in January 2015 highlighted the plight of BNO holders again pressing the former colonial power Britain to offer them an escape route. The push has been for the right of abode in the United Kingdom as many feel that they have been kicked to the side after 1997. The BNO currently only allows the holders to enter the UK without a visa and get consular assistance abroad, but they have no right to live in Britain. “It is an extra option for Hong Kong people — it’s a right they deserve,” says Sampson Noble, a 30-year-old Hong Kong Chinese resident who runs the BritishHongKong campaign group. “I was born British,” he added. “It should not relate to my ethnicity. “We were ruled for 156 years and we are being discriminated against,” said Humphrey Lau, a campaigner for the group. Over the years many have seen the BNO as having kept China happy after the handover by not offering Hong Kongers an alternative citizenship. It also prevented an influx into Britain however one has to wonder today considering the influx of otherwise unqualified immigrants entering Britain if offering the right to abode would not have been better long term solving both labour and skills shortages long term.